Just happened to come across this campaign in FB (Rachel’s FB page to be exact!) and i find it really beneficial so I’m sharing with you ladies! The Society for Colposcopy and Cervical Pathology of Singapore aims to reduce cervical cancer rates in Singapore and to raise awareness among ladies, a campaign is held in place known as Power Over Cervical Cancer.. Through this campaign, the society worked with various support groups to plan activities to educate and raise awareness of cervical cancer and prevention methods (Which can be detected early with regular pap smear test and prevented with vaccination). Cervical cancer is the 2nd most common cancer affecting women worldwide, and in Singapore, 1 woman is diagnosed with cervical cancer every 2 days. The good news is that this is the only woman’s cancer which is preventable. Therefore, the society for Colposcopy and Cervical Pathology of Singapore hopes that through this non-profit cervical cancer awareness campaign – Power Over Cervical Cancer (POCC), mass females will be educated more about the danger of cervical cancer and learn how they can protect themselves. This year’s campaign theme is known as“You have the Power!”. As a woman in today’s society, you have the power and capabilities to enjoy the best in life, to live the way you want and most importantly, to protect yourself! 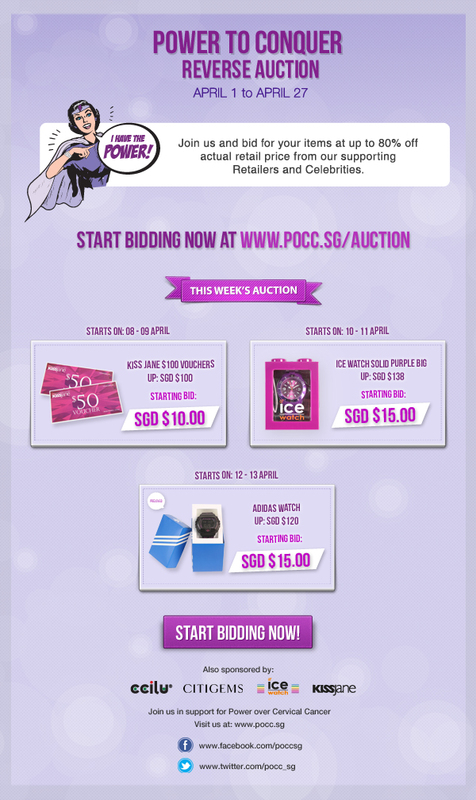 The campaign will kick-start with ‘Power to Conquer’ – For this campaign, there will be an online Reverse Auction activity whereby an item will be up for bid (from as low as 80% of the retail price) every 2 days. What’s so special about this reverse auction will be that the one with the LOWEST UNIQUE BID wins. FYI, these exclusive items are proudly sponsored by supporting retail partners and celebrity ambassadors. Before I go, here’s an announcement ad for next week’s auction highlights and I’m aiming after the KISSJANE’s vouchers.. hahahaha! For this challenge, there will be eight retail merchants offering special item/ service for sale at an attractive promo price. A “Challenge Game Card”will be introduced whereby the participant will need to complete at least 4 “challenge tasks” on the cards from the participating merchants and enter in a grand lucky draw with lots of exciting prizes. By taking part in this unique Challenge, you will not only enjoy exclusive offers at the participating merchants and also stand to win more prizes! “Power to Enjoy Retail Therapy” will be held on 26th May from 11am – 8pm at *Scape Orchard, Warehouse which is a 10,000sqf indoor air-conditioned area. Through this female only indulgence event, the aim is to reach out to ladies and spread the awareness message + to pamper ladies with all things purple and bag great bargains. (Event) SK-II First Ever IT’ guy and ‘IT’ girl! (Sponsored Review) Elite Models cosmetics – UV Base (Pink) & Intense Kajal!